If you are put off building a pond because it looks difficult, then think again. Hozelock Cyprio has a range of pond liners that are designed to make it easy. Our preformed liners come in a variety of inspiring shapes, and our top quality flexible liner allows you to make a larger pond, as unique as you can imagine. Most soil is unable to hold water, and so a liner is neccessary to stop the water escaping. You can build a pond using concrete, but that can be very hard work. 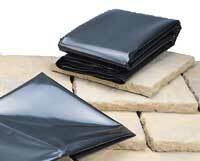 Using a plastic liner allows you to build a pond without using concrete. There are two basic sorts. Preformed liners are made out of rigid plastic in five different shapes. If you are building a pond for the first time and have no firm idea of the shape of pond you want these are ideal. 20 year guarantee. Resistant to U.V. light, frost, stones and roots. With these liners because you buy as much as you need you are able to construct any shape of pond, your imagination is your only limit. 30 year guarantee for liner off the roll, 15 year guarantee for prepacked liner. Highly resistant to U.V. light , temperature and rot. Picking the right size of flexible liner. In order to choose a flexible liner you need you know the maximum length of the pond, the maximum width and the maximum depth of the pond yo wish to create. For more information visit our "building your first pond" section.